Brand new album from Martin Bramah and his band of perennial outsiders. The cult bands cult band. Where futures and pasts collide… Ged Babey picks up the pieces. I had to wrestle John Robb for the job of reviewing this – luckily I won. He’s not as tough as he looks. That’s a lie, but a measure of just how great this album is. Like the Nightingales, the Cravats, Subway Sect, Wire, Monochrome Set ….the Blue Orchids are another of the old guard from the new wave era, back and going through a Second Prime, despite their years or perhaps because of them. One day perhaps Martin Bramah will read a review of the Blue Orchids which doesn’t mention the Fall. But not today. The Once and Future Thing is basically the album which Fall-fans-of-old who haven’t been digging Mark E Smiths erratic self-parody over the past ten years, have been waiting for. If Grotesque and Slates were classic(al) Fall in your opinion, then chances are you’ll like a fair proportion of this ragged, rickety, ramshackle album. ( The 3 R’s, the 3 R’s…). I mean that in a good way -as opposed to over-produced, auto-tuned and slick. 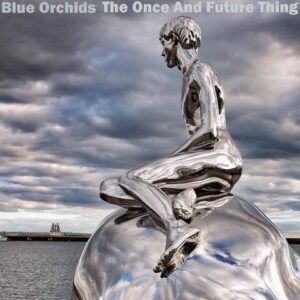 There’s more to Blue Orchids than the Fall-connection though. There always has been. They have a gentle, poetic psychedelic side, and on this album a lot of cynical wit. Bramah is a very under-rated lyricist and some of his best herein are not disimillar to Arctic Monkey Alex Turners. In fact Feather From the Sun is very Monkeys full stop. (Meant in a wholly positive, complimentary way.) Not that the Blue Orchids have been studying them I imagine – its just one of those coincidences… although Dr John Cooper Clarke is on the Monkeys AM album and Slum Cavern Jest! ( a very stoned-sounding Orchids mini-album) was recorded at JCC’s home studio. Whatever. Opener ‘Good Day to Live’ is a second cousin once removed to Nightingales cover of ‘Lets Think About Living‘, but the weakest track on the album and bad choice to start proceedings as Bramah sounds croaky and the backing vocals are annoying. I do love the line ‘It’s not your money, if its not your face on it’. Jam Today is tons better and like a classic piece of Ray Davies railing against austerity. ‘Ricky is a dandy rake, chooses only to eat cake…’. Could it concern a certain Kaiser Chief? ‘Feather From The Sun ‘is the first of three masterpieces on the album. It is self-descriptive within it’s lyrics as ‘Diaphanous and majestic’. A real piece of modern, low-budget psychedelia and as good as any of the old Blue Orchids classics. Wonderful guitar-playing too. Rosy Hours is a delicate and beautiful piece of puzzling poetry whilst Iron Tree reminds me of the brilliant Kill Pretty with slide guitar. August Rebels ( pronounced with the emphasis like this; aug-GUST reb-BELLS) is a wonky slice of genius that recalls the Happy Mondays at their best . “The Revolution will Not Be …. Serious. the Revolution Will Be.. Hilarious! ” It’s one of those songs that would be great to dance to drunk at an old Folks Indie Disco! The pre-planned ad-libs of ‘Give ‘Em Enough Dope” and ‘Fare-weather, my friends!’ are brilliant. As the press release quite rightly says “The new songs on ‘The Once and Future Thing’ confirm Bramah’s status as one of the UK’s most inventive and original guitarists and a superbly measured, thoughtful lyricist.” I don’t agree with the assertion that this is his most cohesive album though. It is too all-over-the-place with beautiful, idiosyncratic poetry being followed by rowche rumbling garage singalongs – like Motorway -a cross between Container Drivers and ‘Do the Hucklebuck (Hassle-smuck) and the woozy call and response of Whisky Burn. Groundhog Life is a wonderful title for a song and its a claustrophobic epic of dark poetic weirdness. Hints of Velvets, Doors and even a bit of Bowie. You can try and unravel the lyrics whilst you listen to the backwards-bassline, dramatic piano stabs and shivering guitar. And increase your vocabulary / word-power; todays word -‘sacredotal’. Perfectly imperfect. Beautifully flawed. This is Blue Orchids Second Greatest Hit. Band Biography and Current activities are here – where you can buy loads of lovely ‘product’. Backing Bramah live will be a new band comprising John Paul Moran (The Monochrome Set, Rapid Pig) on keyboards; on drums, Chris Connolly (The Glitter Band, Ed Banger and the Nosebleeds, V2); and Vince Hunt (Inca Babies, A Witness) on bass.” They’ll be playing a set of classics from the band’s four main albums – The Greatest Hit, The Sleeper, Mystic Bud and Slum Cavern Jest – returning Bramah’s mesmering, shamanic performances to the stage with his new material. There’ll also be samplings from Bramah’s various musical reincarnations as Factory Star and as a solo artist.